'I am Irish on my mother’s side, and half on my father’s side’, Lawrence Durrell said in a 1970 television interview. It was a story he repeated with various permutations and contradictions throughout his life. Not surprisingly, when Durrell died in 1990 his obituary in The New York Times described him as the son of an 'Irish-born father'. The Daily Telegraph in London said the same. The British Library, however, took a somewhat different view when it described Durrell’s ancestors as ‘English on his father’s side and Irish on his mother’s side’ on their recently released CD of Durrell's readings and interviews in their Spoken Word series. But the truth about Durrell is that he had good English roots on both sides of his family. Hacheston in Suffolk. Its population in the mid-nineteenth century was barely four hundred. The widowed Mahala Durrell lived on this street when she gave birth in 1851 to her illegitimate son Samuel Stearn Durrell, grandfather of Lawrence Durrell. The paternal side of the family came from Suffolk, a deeply rural county northeast of London. 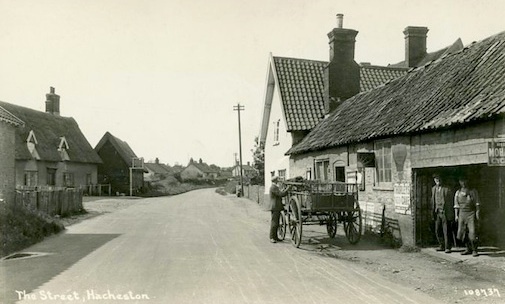 Mahala Durrell, who lived in the village of Hacheston, was Lawrence Durrell's great grandmother. Her husband, a sailor called William Durrell, committed suicide some years before she gave birth to an illegitimate son. Boldly fixing responsibility on the child’s father, a landowner called Samuel Stearn, she baptised her boy Samuel Stearn Durrell. At the age of eighteen Samuel Durrell joined the army and was soon shipped to India, saw service in Afghanistan and China, and achieved the rank of major before retiring to England. Major Durrell’s children were all born in India, among them Lawrence Samuel, who married the India-born Louisa Dixie; their oldest child, likewise born in India, was the future novelist and poet Lawrence Durrell. Dixie is an English surname, primarily local to East Anglia, that is to the same part of England as the Durrells and Stearns in Suffolk. Lawrence Durrell’s own daughter Penelope spent years interviewing family members and searching official records seeking evidence that the Dixies had a connection with Ireland but she drew a blank. There is one exception to Lawrence Durrell’s English ancestry: a young widow named Johanna Doherty, born O’Brien, who married Louisa’s grandfather John Dixie, a sergeant-major in the Sappers and Miners, at Delhi in 1845. Assuming that Johanna was herself wholly Irish, that would make Durrell at best one-eighth Irish. But Johanna’s ancestry is open to doubt. 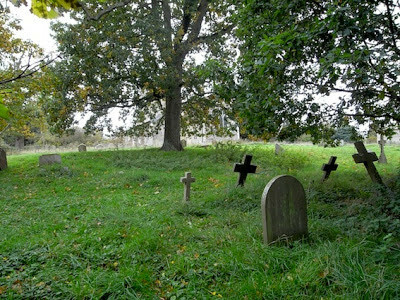 The rounded gravestone of Lawrence Durrell's great grandmother Mahala Durrell in a Suffolk churchyard. Lawrence Durrell is not known to have mentioned his slight Irish ancestry until he was twenty-four and living in Corfu where he began a correspondence with Henry Miller, an American who disliked the English. Suddenly Durrell was 'pure Anglo-Irish-Indian ASH Blond', as he exotically described himself to the older and admired writer. But Irishness also had another appeal to Durrell. According to the Concise Oxford Dictionary Irishness can refer to ‘their reputation for illogicality’, and for Durrell, whose developing genius in part lay in his fantastical imagination, he felt the need to escape the bonds of logic, of cause and effect, and of space and time. The whole of Durrell's work, from Prospero's Cell, his island book about Corfu, through The Alexandria Quartet and The Avignon Quintet, presents a universe of unconfined dimensions in which past and present are not distinct, in which human personalities merge, in which the writer, the artist, is the supreme and unbridled creator. Or in the words of one of Durrell’s reproving English critics P N Furbank, ‘He just makes it up’. To the orderly English mind, Durrell does not play by the rules. This substantial house several miles from Hacheston belonged to Mahala Durrell's lover, the father of her son. 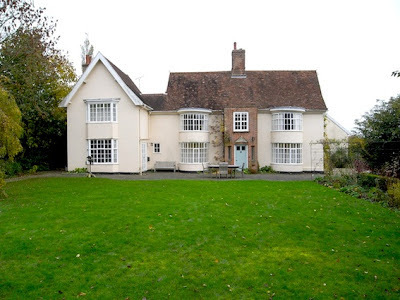 The future poet and novelist was not a Durrell at all, instead he was the great grandson of the Suffolk landowner Samuel Stearn. In later life Durrell rubbished his earlier claims to be literally Irish, laughing it off as a joke which people fell for easily. And in Livia, the second volume of his Avignon Quintet, he has his character Sutcliffe, to whom he has given a biography very similar to his own youthful experience of England, and who is himself the literary creation of another character in the novel, explain how he invented his Irishness: ‘For my part I told everybody that I lived in Ireland in a fairy’s armpit’. Michael Haag is writing a biography of Lawrence Durrell to be published by Yale University Press. The colour photographs are his copyright. I like Miller because of that all-singing-and-dancing act. It makes me laugh. As it happens I do not recall a single sexual episode in the book, but if he had a dozen women upside down or in the gutter or on slabs, good for him, as long as he was singing. I buy the artist as free-to-do-what-he-likes not as a principle but when he proves himself a better singer and dancer than a social worker. Winterson faults Turner for offering too little social and political background and then announces the sort of background she has in mind, brothels, women’s suffrage, the pill. In fact Miller was one of the very few artists of his times who knew what to say about the all transcending horrors of his moment. If I were introducing anyone to the great dark cloud lowering over the world in the early 1930s I would have them read four books, Graham Greene's Stamboul Train (1932), Louis Ferdinand Céline's Journey to the End of the Night (1932), Elias Canetti's Auto da Fé (1935), and Henry Miller's Tropic of Cancer (1934). Greene called Stamboul Train an entertainment; it is a pleasant introduction to the disease of antisemitism that had overtaken the whole of continental Europe well before Hitler was elected and made it official policy. Journey to the End of the Night is a wonderful novel, a joyous vicious novel of ugliness and hatred, the ugliness and hatred having taken possession of Céline himself, though he is exculpated by the energy and brilliance of his book which does show you in magnificent prose how repellent the times could be. Canetti’s Auto da Fé is pure disgust and horror, locked in claustrophobia. Greene the Englishman is cool and sane and observes clearly and lightly. But Céline the Frenchman and Canetti the Bulgarian in Vienna are defeated. Their books are about the decomposition of the world of which they are a part; they feel the gangrene at work within themselves. They write out of defeat; they offer no way out. Miller, the late-arriving American in Paris, could have written a book of utter degradation in keeping with the times, but instead he sings. It is quite beautiful; the world is hideous and going down the drain, and Miller sings. The all-American Miller did not choose death; he wrote an outrageous American novel full of energy, optimism and laughs. That is what is so good about Henry Miller. That is why Tropic of Cancer is morally and historically an important book. 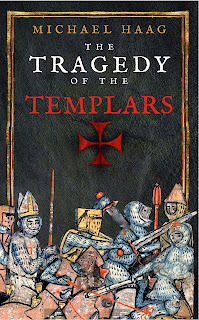 The designers at Profile Books have been coming up with cover designs for The Tragedy of the Templars. This cover artwork is the favourite at the moment. The Tragedy of the Templars tells the story of the Arab and Turkish occupation of the Middle East, its recovery by the Crusaders, and the ultimate failure and tragedy of the crusader venture. 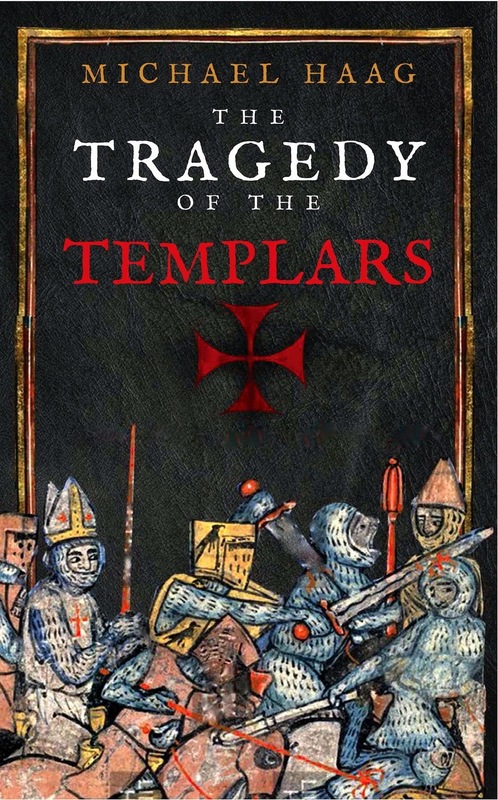 The Tragedy of the Templars will be published in autumn 2012 by Profile Books in Britain and in summer 2013 by Harper Collins in the United States.